The ®Fat Darrell Sandwich – #DoubleFML FatDarrellPalooza! It all started out with the Fat Cat, a Rutgers University staple invented in 1979, that consists of two cheeseburgers, French fries, lettuce, tomato and onions – all on a single sub roll. The Fat Cat remained the number one selling sandwich on campus until 1997 when a new king was crowned – The ®Fat Darrell Sandwich! Darrell W. Butler created The ®Fat Darrell as a Rutgers University sophomore who had grown tired of ordering the same sandwiches all of the time. Instead, what he craved were chicken fingers, mozzarella sticks and French fries. Unfortunately, those items separately would have cost much more than he could afford on a limited college budget. The Fat Cat however, was only $4.25 at the time, so a quick-thinking Darrell convinced the vendor to make a sandwich that would be similar to The ®Fat Cat (and for the same low price!) but with his own ingredients. After the owner agreed, Darrell rattled off his now infamous order of chicken fingers, mozzarella sticks, French fries, lettuce, tomato and marinara sauce all on a single sub roll. As Darrell ate and celebrated his frugal victory, he watched as the next 10 people in line asked to try his new idea. In fact, the vendors went on to sell 50 ®Fat Darrell sandwiches that first night and it remains among the top selling sandwiches on campus today! After witnessing the notoriety and recognition Darrell received after having posters of him all over campus, other students scrambled to create their own signature sandwiches to be sold at the various vendors as well. Eventually the owners realized that they would have to come up with some rules and regulations before things got completely out of hand. They originally decided to require students to eat 3 Fat sandwiches in less than an hour before they would be allowed to name one of their own. However, after so many hungry college students were able to do so easily, they increased the requirements to the current challenge of 5 Fat sandwiches in 45 minutes or less! In 2004, MAXIM Magazine crowned The ®Fat Darrell as the best sandwich in the nation. As a result, The ®Fat Darrell sandwich has been featured on various television, radio, print and digital media outlets. Many of those interviews and programs can be found by heading over to our ®Fat Darrell Media Archive Page! 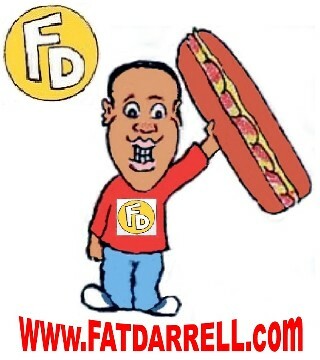 If you would like to sell The ®Fat Darrell sandwich at your shop or book Darrell W. Butler for an interview, please use the contact page to obtain more information! Also check out our #DoubleFML blog post celebrating The Top 10 Moments in ®Fat Darrell Sandwich History by following this link! The ®Fat Darrell sandwich is the federally registered property of ®Fat Darrell’s LLC™. The Unauthorized sale of The ®Fat Darrell sandwich or use of The ®Fat Darrell name, images and logos is strictly prohibited. Violations will be punished to the full extent of the law. All Rights Reserved.